In The Outlaws is Coming, the villainous Rance Roden plans to kill off all the buffalo and cause the then-starving American Indians (native Americans nowadays) to attack the U.S. Calvary in retaliation, thinking the Calvary to be responsible. After they destroy the U.S. Cavalry (his real enemy), Rance and his gang will take over the West. What can prevent this wanton carnage? Would you believe an Eastern magazine editor and the Three Stooges? A Boston magazine gets wind of the buffalo slaughter and sends editor Kenneth Cabot (Adam West, a year before his fame as TV’s Batman) and his associates (Moe, Larry and Curly Joe) to Casper, Wyoming to investigate. Once there, Ken’s shooting skills (secretly aided by sharp shooter, and romantic interest, Annie Oakley) earns him the title of town sheriff. Rance has his band of bad guys called upon to have them all wiped out, but the Stooges sneak into the gang’s hideout while asleep and glue their firearms to their holsters. When Ken confronts the bad guys, the bad guys (with Stooge-like prompting from the boys) decide that a life of justice is better than crime. Meanwhile, Rance and Trigger attempt to sell firearms to the Indians, but the Stooges foil this plan by snapping a picture of them selling in the process. One inside joke is that the various bad guys were all TV kid show hosts of the Three Stooges TV program at the time. One of them, Don Lamond, was Larry Fine’s son-in-law — and the director was Norman Maurer, Moe’s son-in-law. Get the long and the short of the Three Stooges in this exciting Old West double feature, which contains one feature-length film from the â60s along with a classic short film from the â30s. 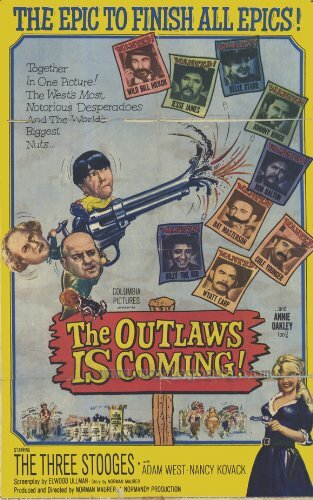 The Outlaws is Coming (1965), also known as The Three Stooges Meet the Gunslingers, is a wacky Western in which Larry, Moe and Curly-joe co-star with Adam West (TV’s “Batman“), Henry Gibson (TV’s “Laugh-In“), longtime Stooge sidekick Emil Sitka and Nancy Kovack (Frankie and Johnny). The Stooges are sent, along with an editor, by a conservationist magazine publisher on the East Coast to investigate a gunslinger who is wiping out the buffalo population in the West in order to turn the Indians against his enemy, the U.S. Cavalry. With a little help from Annie Oakley and an unusual cache of weapons (including cream pies), they are able to dodge the posse’s bullets…and make the West safe for the wild creatures that roam its frontiers. BONUS SHORT FILM: In Goofs and Saddles(1937), Moe Howard, Larry Fine and Curly Howard are enlisted by Civil War General Muster to help save the country from a notorious cattle rustler. Norman Maurer is the son-in-law of Moe Howard. Jeffrey Scott, who plays “Kid,” is Maurer’s son and Moe’s grandson. This was The Three Stooges’ final completed film as a group. They made one more film together, Kook’s Tour (1970), but the film sat unfinished and unreleased for years due to Larry Fine suffering a stroke before the movie was complete. 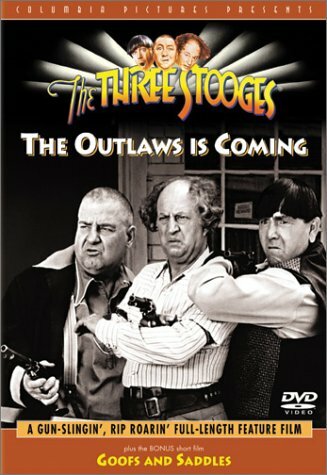 The actors who portray the gunslingers were hosts of The Three Stooges television programs in the 1960s. One of them, Don Lamond, was Larry Fine’s son-in-law. Emil Sitka‘s final film appearance with The Three Stooges. A regular in their films for decades, Sitka would actually officially become a Stooge in the early 1970s after Larry Fine was forced to retire, but he never made a movie in this role. [scene cuts to] Moe (Moe Howard): Alright you idiots, hurry up. Moe (Moe Howard): [talking about the skunk, Elvis] watch out now, he’s dangerous. Larry (Larry Fine): I don’t trust you, either. Kenneth Cabot (Adam West): Boys, please, I’m working. Moe (Moe Howard): That’s all right, Mr. Cabot, you ain’t bothering us! Curly Joe (Curly Joe DeRita): I know the problem – too much pizza in my pizacota. Larry (Larry Fine): Not me, to Wyoming. It’s full of gunslingers, gila monsters, rattlesnakes, and Indians! Curly Joe (Curly Joe DeRita): And besides, it’s against our religion. Yeah, we’re devout cowards! Curly Joe (Curly Joe DeRita): There’s only one thing I’d ask for if I had to tangle with that guy! Curly Joe (Curly Joe DeRita): I canât see their feet, but the rest of them don’t look so clean. Moe (Moe Howard): We’d rather you hang us from that tree. Charlie Horse (Henry Gibson): That tree won’t be ready for 60 years! Moe (Moe Howard): Weâll wait. Johnny Ringo: [after shooting a telegraph delivery man] Thatâll teach ya to interrupt me when I’m swoonin’ the gals!